Gregor Townsend is certain that Mark Bennett will not attempt another one-handed touchdown as Glasgow Warriors missed a winning bonus point. Scotland centre Bennett let the ball slip from his grasp as he looked likely to score a try during Sunday's 27-20 win over Cardiff Blues. "He put his hand up at half-time," said his head coach. "It was unlucky. "It was great seeing him go over, a nice move, but obviously he'll put the ball down with two hands from now on." 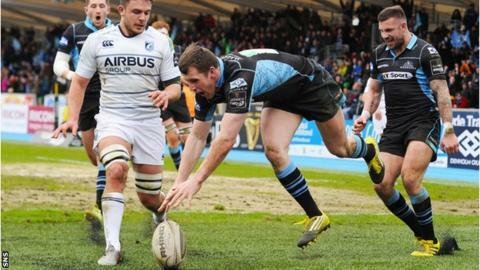 Having fallen a try short of a bonus point, reigning champions Glasgow missed the opportunity to move above Edinburgh into sixth place in the Pro12 table. Although they have games in hand over the teams above, Townsend told BBC Scotland: "We would have been disappointed even if we had picked up a bonus point and sneaked one in the end. "Parts of that game weren't as accurate as we have to play and how we can play. "In the first 50 minutes, we did some really good things, we showed at times how dangerous we can be. We showed a real determination in defence to compete for ball and we got a few turnovers in the first half. "But we set ourselves higher standards. The last half hour, we played our poorest rugby." Warriors, who conceded three second-half tries as Cardiff secured themselves a losing bonus point, next face matches against teams lying above them in the table. "We need to be better, especially with Ulster and Leinster in our next two games," said Townsend. A high point for the Glasgow coach was the return of Henry Pyrgos for the first time since October after the Scotland scrum-half underwent wrist surgery. "I thought Henry Pyrgos was outstanding," said Townsend. "To be out of the game for four months and really add tempo to our game, make the right decisions of where to attack and the players followed him and we got a couple of cracking tries in there." Townsend was not about to make excuses because of the state of a Scotstoun pitch that has still not recovered fully from recent postponements because of flooding. "I think the pitch certainly slowed the tempo of both teams - I know a couple of our guys cramped up," he added. "It's obviously not in perfect condition, but a lot of the issues were accuracy."